Time is what we want the most, but also what we waste the most. This summer let's put our time to some real good use. It's now time to build a smacking portfolio and an awesome skillset which any company would love to hire. Stand out from the crowds and be a hero of your batch. 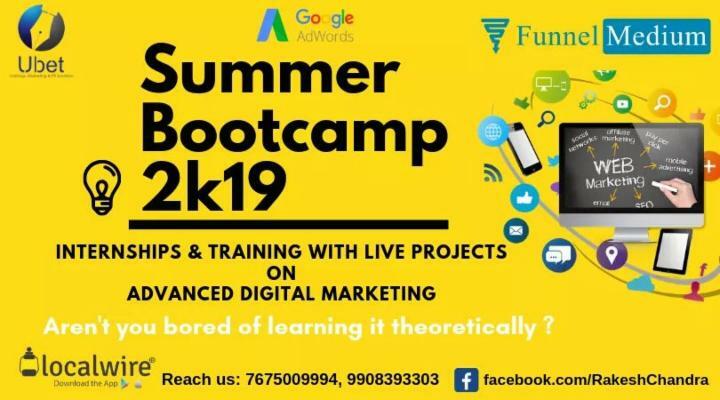 Ubet Solutions: An emerging startup from Vizag now announces its Summer Trainings and Internships program on Advanced Digital Marketing. Digital Marketing is an umbrella term for all your Online Marketing Goals & needs. Digital marketing is the future of businesses. Become a certified Digital Marketer. Get yourself Google Certification and grab an opportunity to work in live & real-time business projects on a complete 30 days summer internship/training. Get trained by real-time Industry experts at a never seen prize before for the first time ever in Vizag at just 5000/- INR. From basic blog/website building to advanced SEO techniques including all types of Digital Marketing Strategies. Remember Heroes are not born, they are made. They are made from sheer hard work and dedication. The skillset is what makes them a hero. Time for you to be a super Intern.